Stray and feral cats are at home outside, but they can always use some extra help in cold or severe weather. Follow these tips to help them stay even safer, warmer, and healthier during severe storms and winter months. Shelters keep feral cat colonies comfortable in cold and other harsh or severe weather conditions. Placing discreet shelters in quiet locations away from foot traffic helps keep cats from taking shelter in places where they are in danger or not welcome. A good size for a shelter is at least 2’x3’ and at least 18” high. Larger shelters are not necessarily better, since heat disperses quickly, leaving the inside as cold as the outside. Cats will huddle together inside for warmth, so provide colonies with multiple shelters that can fit three to five cats each. If you are caring for fewer cats, use a smaller shelter so it takes less body heat to warm up. Make sure the door is no bigger than six to eight inches wide to keep out other animals. If you’re modifying a dog house, you’ll need to block off part of the door to make it cat-sized. A flap on the door will also keep snow, rain, and wind out. Insulate the shelter with straw to repel moisture and keep cats warm and dry (Note: Make sure it’s straw, but not hay, because hay absorbs moisture. Learn the difference between straw and hay.) Blankets may seem like a good idea, but since they are also extremely absorbent, they make bad bedding. Raise shelters off the cold ground to conserve warmth. Wooden pallets stuffed with insulation work well for elevating shelters and keeping out drafts. That’s a start – read more about constructing feral cat shelters in our Colony Care Guide. A simple feeding station with a roof and sides will protect food and cats from precipitation and icy breezes during meal times. Building a feeding station also establishes a specific area where the cats know to come for food, so they spend as little time exposed to the elements as possible. As with shelters, elevating the floor of the feeding station off the ground keeps food and paws warmer. Feeding stations also offer many year-round benefits for your colony, including deterring insects and making colony management easier. The moderate time and effort it takes to build one this winter will be well worth it all year round! Find out how to build your own feeding station in our Colony Care Guide. Feed the cats on a regular schedule. The cats will know when to come around, and both the food and the cats will spend less time exposed to the weather. On average, you can expect an adult feral cat to eat roughly 5.5 ounces of wet (canned) cat food and 2 ounces of dry food daily in temperate weather (add a half cup to that amount if only feeding dry food). In colder weather, make sure to feed larger portions than you usually do for an extra caloric boost. Observe the cats and the time it takes for the food to be eaten. If the cats eat all of the food in 15 minutes or less, put out a bit more. If you can keep it from freezing, feed wet food—it’s easier to digest, so cats save more energy for keeping warm. Consider warming canned food prior to arriving at the site and using insulated bags to keep the food warm during travel. Since wet food is also quicker to freeze, make sure you put out dry food too, or if you think the food is very likely to freeze, you may want to feed only dry food. Change water bowls twice daily to keep water from freezing. Use deep bowls rather than wide ones, and refill them with hot or warm water. If the colony is close to an outlet, heated electric bowls will also do the trick. Keep the water in the sun and use dark colored bowls that will absorb the sun’s heat. Purchase a Solar Sipper, a solar powered bowl, although we’ve learned from experience that these bowls work best at temperatures of 30°F or higher and must be kept in the sun. Insulate the bowls as instructed above or use double-layered bowls—they have an insulated air layer between the surface the water touches and the surface against the ground. Shield the water dish from wind by placing it inside a small styrofoam cooler or surround the top and sides of the feeding area with plexiglass to create a greenhouse environment for the water. Purchase a microwavable heating pad like a Snuggle Safe disk to use under the water bowl. If there is a water source like a spigot, run the water slightly, since it won’t freeze as quickly as still water. Before starting your car, give the hood a tap and check between the tires—cats will sometimes crawl into the engine or hide underneath the car for warmth. Winter is also the time of year for antifreeze, which often tastes irresistible to cats and other animals, but is toxic and deadly. Keep it out of reach and clean up any spills! 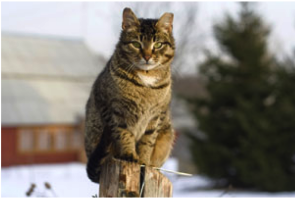 Read about common symptoms of antifreeze poisoning in cats. Remember to shovel out cat shelters when you’re shoveling your own driveway. Cats in shelters can get snowed in, so keep entrances clear and shovel an exit for cats who may be taking refuge under bushes, porches, or other hiding spots. Stay away from salt and chemical melting products. These products can be toxic to animals and harmful to their natural snowshoes—paws!